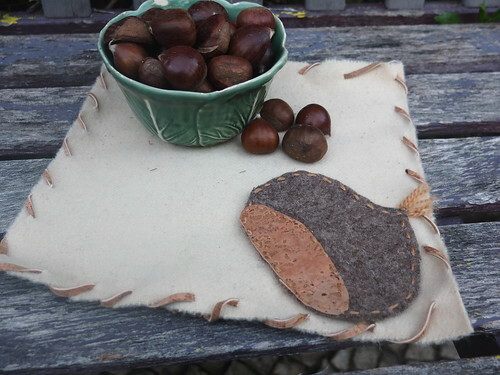 November is the month of the chestnut in Portugal. We celebrate St. Martin's Day preparing a magusto festivity. In that day you will find us eating roasted chestnuts and drinking água pé -(literal translation is "foot water") - a traditional and very mild alcoholic drink. We will celebrate St Martin's day next 11th November and, as always, we expect very shinny days!! At that time the weather is always different from the other Autumn days... Very good and warm. That's why we call this period Verão de S. Martinho - St. Martin's Summer. The legend tells that on a very cold and rainy day Martin, a Roman soldier, cut off half of his cloak and offered one part to a beggar that was dying of the cold. Then the sun begun shinning, by God's intervention, and Martin was able to return home safely. All our children learn this legend at school!! So... 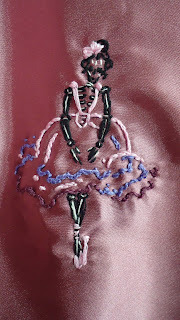 I needed a very easy project that could be made by someone that does not know how to embroider... 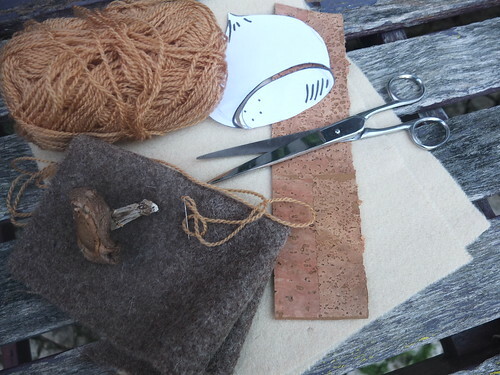 Trying to find out what to do, I took a look at my working surface and I found my favorite materials: burel (a Portuguese felted wool) and cork. With them I knew I could create a chestnut!!! And the next step was, as I usually do, trying to find a simple pattern. As my drawing skills are terrible, usually I google images using words like "chestnut coloring"... And I always find very simple drawings that children use to color... Of course, in the end, I never make like the pattern I found, but for me it is a very powerful inspiration source!! And decided to make a coaster using the chestnut pattern and Portuguese materials. But I made a mistake (not for the first time...) and it ended up very small... What a pity!! Next time I will make beautiful coasters to decorate my S. Martinho's table!! Using the same materials, I applied the chestnut into a burel piece and with a very thin cork strip I created a simple finishing all around. Did you know that these two colors of burel only use the natural colors of wool, no dying materials? 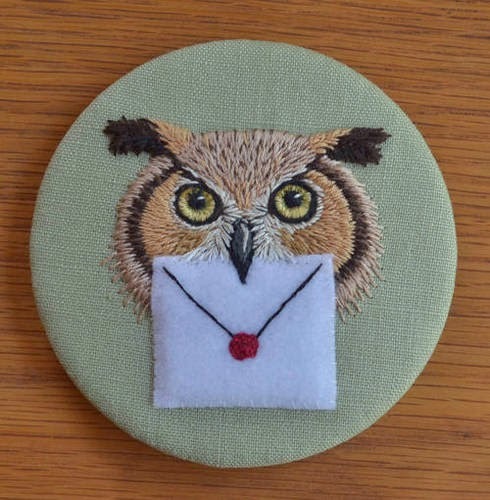 I don't know if there are enough words to describe how talented the Craftster Needlework Featured Artist, Ludi, is. I am constantly blown away by each stitch. Ludi's pieces are rich in texture and hauntingly beautiful. Let's find out a little more about this amazing artist. Tell me about your little bit about yourself. I live in the country with my husband and a bunch of animals; 5 cats, a dog, 5 sheep, many chickens, and of course all the wild animals. My husband and I make things for a living, we have a business making specialty costumes and props for the entertainment industry. In addition we both make things for fun, so we end up spending most of our waking hours making things. 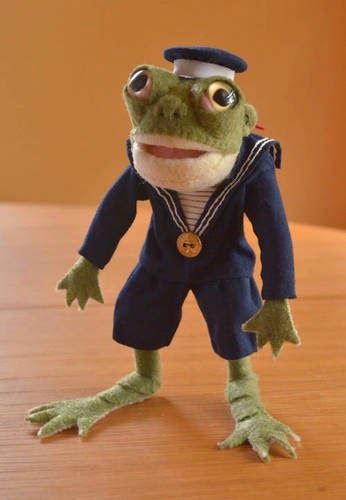 I consider myself primarily a sculptor and have only taken up embroidery in recent months. My other hobbies include gardening and reading. 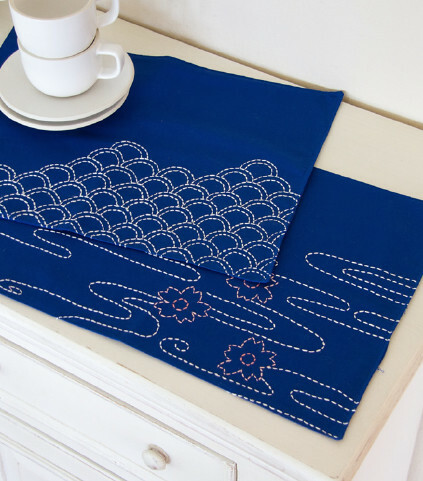 Do you have a favorite out of your recent needlework projects? It’s hard for me to choose, I have so much fun with each piece. 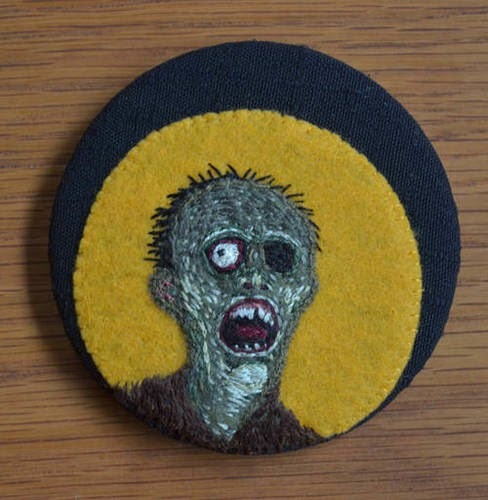 I really enjoyed stitching “Zombie and the Moon” for MissingWillow in the One Tiny Thing October Holidays swap. I’m tremendously inspired by literature, especially my favorite author Mervyn Peake. He’s been my inspiration since my teens. I’m also inspired by other dark fantasists such as HP Lovecraft, HR Wakefield, Poe, etc. Other artists inspire me, and I love looking at other people’s art in all media. I have so many ideas for new embroideries! I hope eventually to do more portraits of fictional characters, but my next project will probably be a “Meowl” a cat-owl hybrid, for my sister. And I want to try my hand at miniature embroidery. Check out Ludi as well as other amazing needlework artist on Craftster.org. 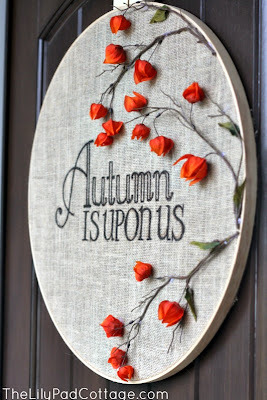 I have a roundup for you all today with some great Autumnal projects. I can't believe how quickly Fall has rolled around, but these projects are excellent for this time of year and sure to help you enjoy the season. 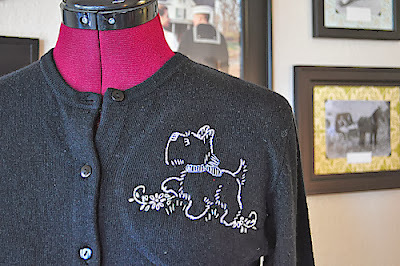 Casey of Elegant Musings has a wonderful tutorial for embroidery on a cardigan. This is perfect for reviving cardigans or embellishing new ones. 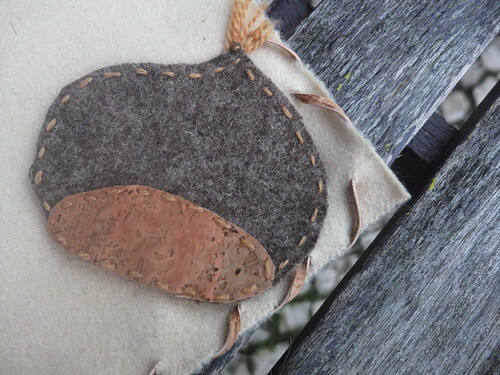 Jessica and Mandy of Little Birdies, put together this adorable Fall Leaf Pillow tutorial for Make and Takes. It sure to bring Autumn into any room. If you are looking for Autumnal decor, Kelly of The Lilypad Cottage has this great tutorial for creating a door hanging using an embroidery hoop. Does your dining room need a little update? 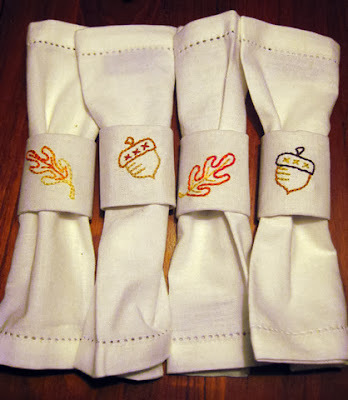 Jenny Hart of Sublime Stitching has a fun Upcycled Napkin Ring Tutorial. I absolutely love the resourcefulness of this tutorial, and if you switch up the embroidery patterns, you could have napkin rings for every season! Hope you enjoy these tutorials and give some of them a try. Fiancé kerchiefs are very popular in Portugal and very sentimental to us. The symbols used are full of meaning, usually related to love feelings. 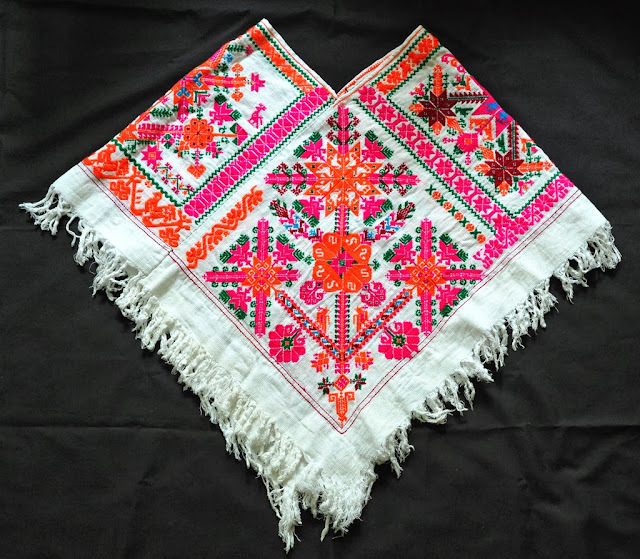 The key is a very ancient motif already present in the first kerchiefs that were embroidered using cross stitch and represents the union between two hearts. In some kerchiefs you'll find embroidered love sayings expressing something similar to: "I give you this key so you can open my heart"
I have had my eye on the amazing collection of Karen Elwell ever since I first joined Flickr. 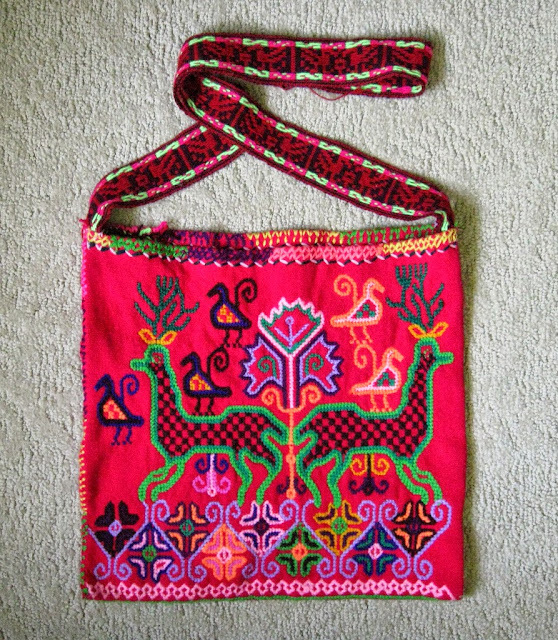 I am particularly fascinated with her beautiful woven and embroidered textiles from Mexico. Stitched dresses and tablecloths have always been a part of my earliest memories, and I'm sure they were my first embroidered inspirations. From textiles to huipils to wood carvings, Karen's eye for beauty is amazing. It's an honor to introduce her to you today - she shares a few favorites from her collection, and was kind enough to answer a few questions. Enjoy this introduction to Karen! How long have you been a collector of textiles? What region is your favorite? 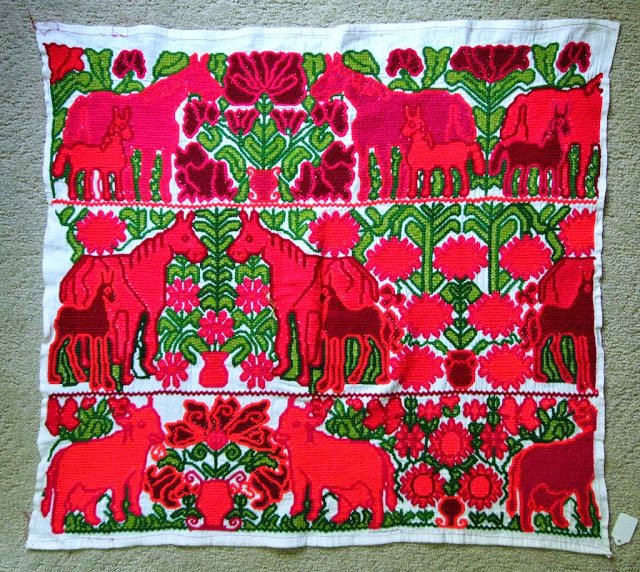 I've been collecting textiles since a trip to Guatemala in the 1970's. But I have been interested in non-western dress since I visited Chicago's Field Museum as a child and saw the exotic textiles and clothing displayed in the museum. I lived in Ecuador for a year in the early 1980's and became very interested in the many regional styles of dress worn in that small country. My first visit to Mexico was in 1985. Back then it was very common to see indigenous Mexican women wearing traditional dress on a daily basis, and I wanted to learn everything I could about the women -- who they were; where they came from -- and their beautiful clothing. The indigenous textiles of Mexico are my favorites. But I also like Guatemalan, Andean and Indonesian textiles a lot. How do you discover the works you feature in your photographs? Many of the photos posted on my Flickr site show textiles from my own collection. I frequently visit museums in Mexico and here in the US to shoot photos of the textiles and clothing on display for posting on Flickr. 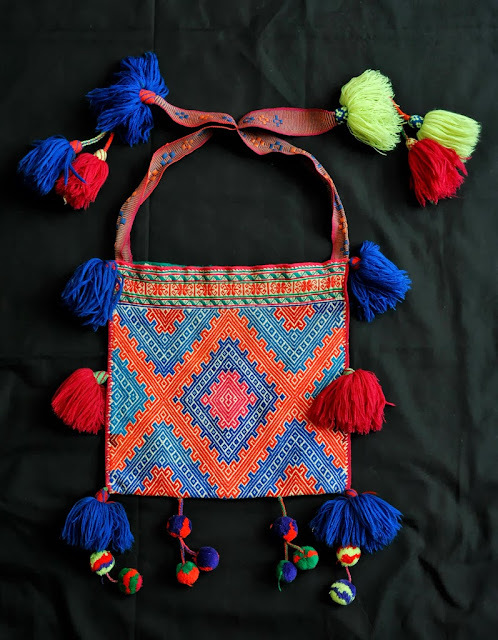 My goal is to create a "virtual museum" which is available to anyone who has an interest in textiles, especially the women in Mexican indigenous communities who created these works of art. 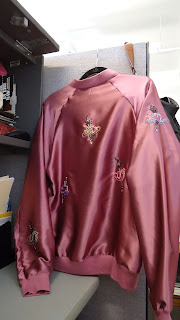 Do you have a favorite style of embroidery? My favorite style of embroidery is cross stitch. That is what always draws my eye. For many years I did cross stitch myself. It was my form of meditation. Your eye for color is wonderful - do you have an art background? I don't have an "art background," although I loved to draw as a child. My Dad taught me to bead on a loom when I was very young, and I think that's why I love cross stitching so much. The stitches are like little beads. What is it about Mexican textiles that interests you most? I love Mexican textiles because of the great variety and, of course, the vibrant colors. There are always "new to me" textiles to be discovered in that huge country. I admire the immense creativity and skill of the women and men who make these textiles, and I find it fascinating that so many design motifs you see in 2013 date back to very ancient times. 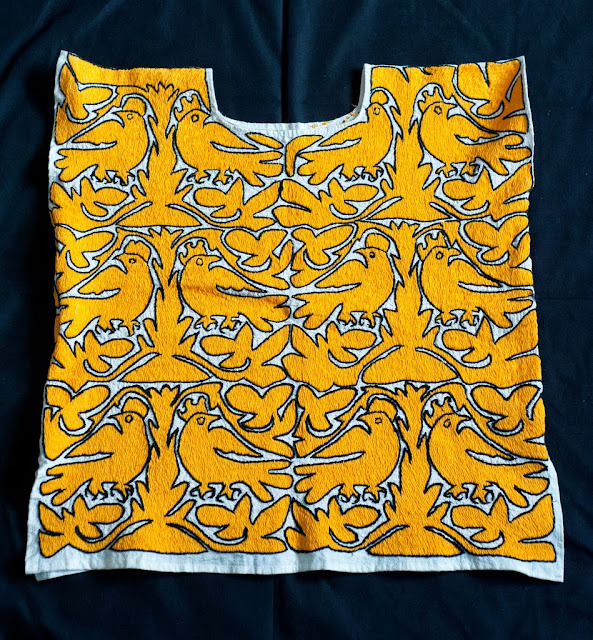 What would you suggest to others who are thinking of becoming collectors of textiles? My advice to budding textile collectors is "If it looks nice, buy it." Collectors should surround themselves with the things they love. There are so many resources available today (the internet mainly) for new collectors to learn about where the textiles are/were made, who made them, and when and why. Many museums all over the world are digitizing their collections and posting photos on the web. I find new photos posted by museums almost every week. Thank you, Karen, for this interview, and for doing such a beautiful work preserving beauty of many cultures. 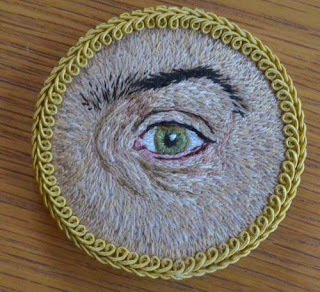 Your appreciation for this beautiful handiwork is truly inspiring! To view more of Karen's collection, be sure to visit her Flickr photos. Olá! This is the day when an embroidery blog became a food blog... Are you prepared for the change? I'm introducing you to caldo verde, a Portuguese traditional dish that has its origins in the northern region of Portugal, Minho, but for a long time was adopted all over the country. Caldo verde is a simple, light dish, that may be served on its own or as part of a larger meal. 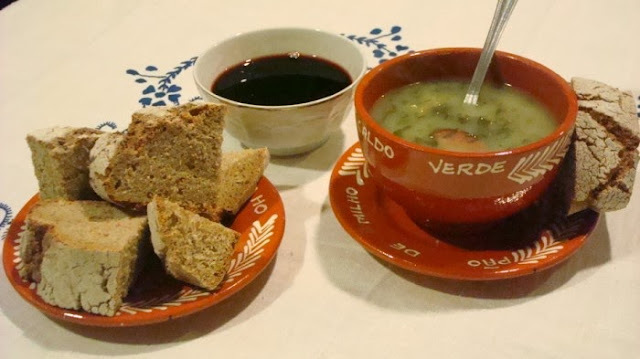 Usually this soup is served with chouriço (pork sausage) and broa - a cornbread leavened with yeast. Caldo Verde means celebration!! 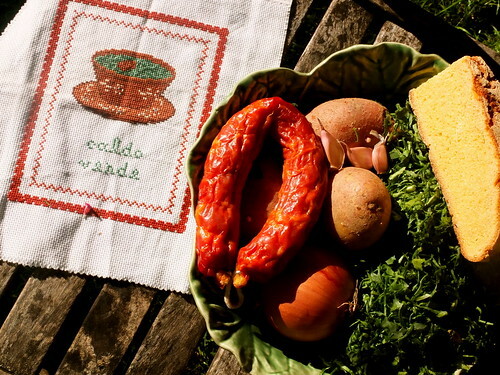 When we, Portuguese people, think of this dish, we remember family gatherings, popular festivities, a late evening meal in a wedding... Because caldo verde is really a very common dish all around the country... From the humblest country home to the most fancy and luxurious table!! - Make a light broth with potatoes, as light as possible. - Take dark green cabbage, or kale--in Portugal called couve galega--roll the leaves tightly and sliced them as thinly as possible. Scald briefly so they are brilliant green. The cabbage should be abundant to give body to the broth. - When ready to serve, add the scalded cabbage to the broth with a little olive oil and let it boil for about 5 minutes, so the olive oil can cook. All you need to make Caldo Verde - only missing olive oil and water!! 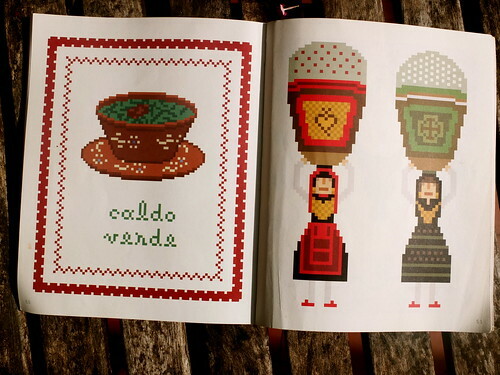 I found this pattern - actually it is not a cross stitch pattern, I had to adapt it - in a very beautiful book that I've already talked about in another post... And this was my first choice of this marvelous book. 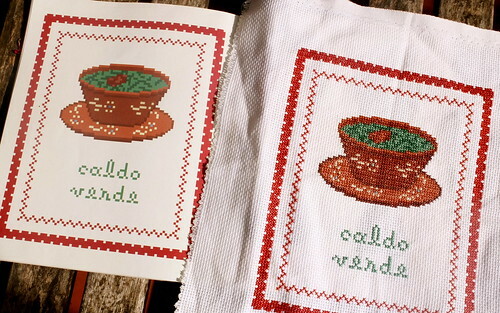 The idea of cross stitching caldo verde was a pleasure and wherever I went with this work in hands, I always received many "UAU"!!! Portuguese people do love caldo verde!! I am a sucker for anything to do with Halloween and anything to do with cute. Gina2424 combines my two favorite things into one. 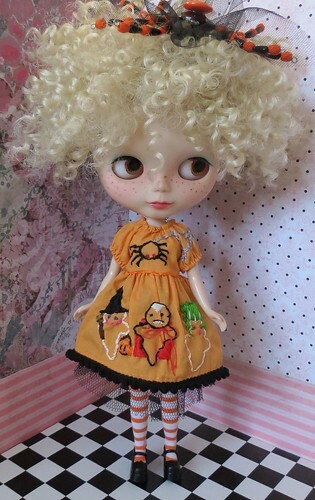 An adorable Halloween dress on the cutest little Blythe. You can not go wrong with this spooky little lady. Vote for Us on Craftsy! Oh wow! Feeling Stitchy has been nominated for an award on Craftsy under Embroidery: Best Tutorials. If you've never visited, Craftsy is a great place to take online classes of the crafty variety. I had no idea we'd been nominated and we're super-honored that someone out there put us in the running! I'd like to especially thank our talented blogger Kristen who has written the Tutorial Tuesday series for the past year and a half, and all of our bloggers and guest bloggers who have contributed tutorials! Please click that badge up above if you'd like to vote for us, and be sure to check out all the awesome blogs up for awards. Thanks, Craftsy! I can't believe Halloween is nearing. It's my most favorite time of year! I can hardly wait for the costumes and treats and pumpkins! I am having a small get together to celebrate Halloween this year and knew that I needed to infuse embroidery into the festivities. I decided on cloth napkins. I used Gina Matarazzo's Halloween Pals embroidery patterns on white cotton for these napkins. I love her patterns and these pumpkin pals are super cute. Step One: Transfer pattern to the lower corner of fabric. Keeping the pattern at least 2-inches away from either edge. I placed the pattern on the lower corner of the right side, but it's up to you which side you prefer. Step Two: Stitch each napkin. When all are complete, wash, dry, and press. I don't like to press the embroidery itself, I usually press around them so as not to snag or warp the stitches. It's a good idea to place a thin piece of fabric over your embroidery to press it, so that the hot iron isn't directly on the stitches. Step Three: Fold the four edges of the napkin over 1/4-inch and press. Step Four: Fold the edges over a second time and press. Step Five: Using the zig-zag stitch setting on a sewing machine, stitch along the fold that you just created to seal the edges and create a clean hem. 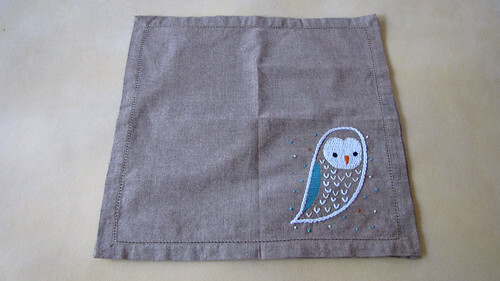 Step Six: Fold the napkin so the embroidery is facing to out. Give each napkin another light press. Step Seven: Set the table and get ready for smiles and Halloween happiness to ensue! This is a fun project to put together before Halloween. Hope you get to give it a try! Nicole from Follow the White Bunny has just released a new pattern, yay! 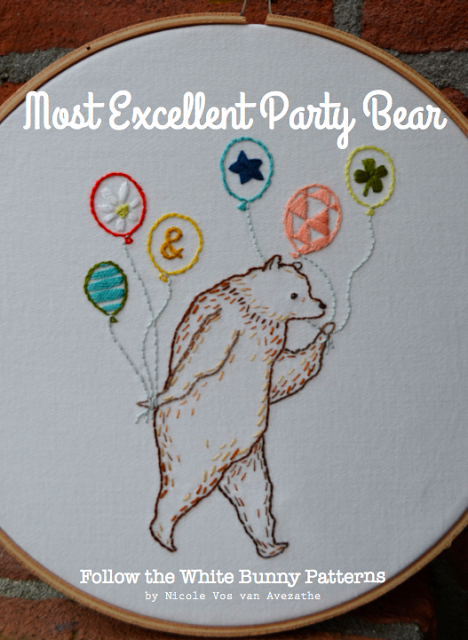 I think this one, the Most Excellent Party Bear, would look fantastic on an extra special birthday card! Sew & Stitch: Review and Giveaway! Hi all! Today I'm super-excited to be reviewing Sew & Stitch Embroidery: 20+ Simple Sewing Projects with 30+ Fresh Embroidery Designs . Alyssa Thomas, the author and creator behind Penguin & Fish sent us the book to review - and we will also be doing a giveaway later in this post! But first, let's have a look at this book - as the title suggests, this book is a blend of sewing and embroidery. If you're like me and not big on sewing, no worries! Many projects are suitable for beginners. 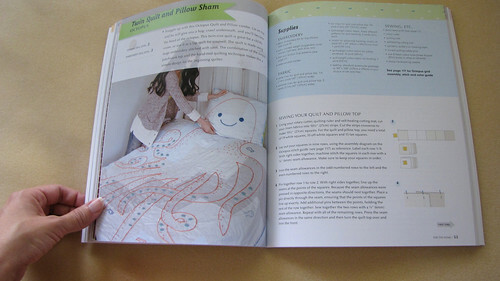 The style throughout the book is cute, whimsical, and beginner-friendly. 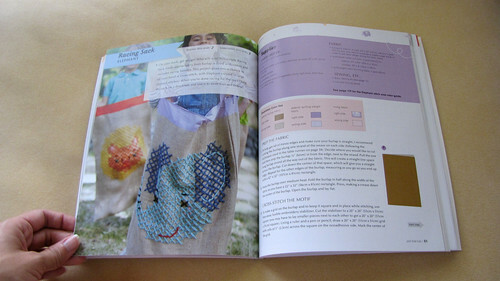 The book is divided into 4 sections: Section 1- Embroidery Essentials features the tools and materials you'll need, a well-illustrated stitch library and intro to basic sewing techniques. 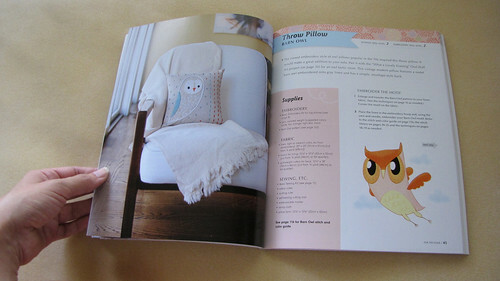 Section 2 - For The Home, has patterns for embellishing household objects and wall art. Section 3 - Just For Fun has sweet, kid-friendly items. Section 4 - Personal Style features embellished clothing, cases, and clutches. 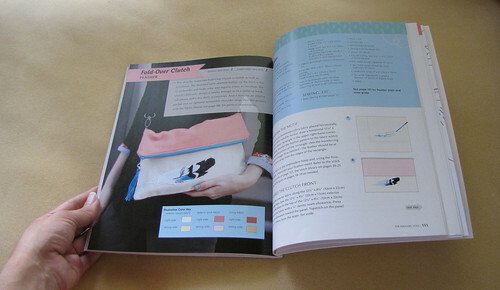 The last pages of the book are dedicated to stitch and color guides, and there is a large, fold-out sheet of iron-on transfers with some of the embroidery patterns. It absolutely possessed me and I knocked out not one but 2 pillows in the past 48 hours! 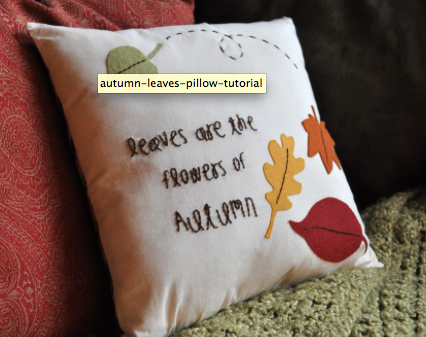 My first pillow was a bust, but it was my fault because I chose a terrible, stretchy material and didn't read the directions - Alyssa suggests using a Chenille needle to stitch with yarn and to stitch on linen. After reading the directions, my second try on linen was much much better! My only caveat with the book is the way the embroidery patterns are distributed - sometimes they are with the content, sometimes you must flip to the back of the book. Color and stitch guides are also separate and at times quite small, so I had to flip between 3 different sections to complete the owl project. On the plus side, most of the smaller embroidery patterns are contained in the iron-on transfer sheet, which is very helpful. Overall, this is a great book, and definitely one I'd be happy to add to my library. The patterns are simple but adorable and very inspiring, and there is plenty of room to make a project your own. And now for the best part - the giveaway! 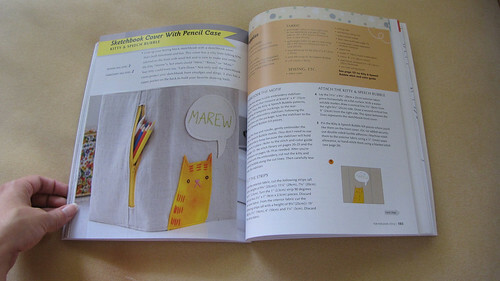 Alyssa has kindly offered us another copy to give to one of our Feeling Stitchy readers! 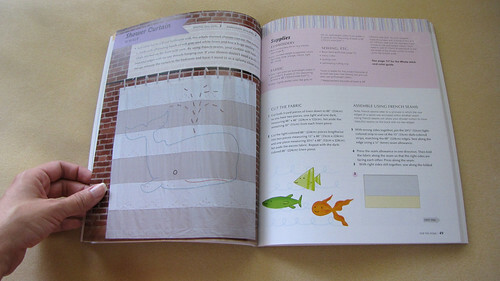 To win a copy of Sew & Stitch Embroidery, leave a comment on this post by Monday, October 14, 9 PM US Central Time. All of our readers may enter, including our International readers! Tell us simply which of the projects pictured is your favorite. Thanks Alyssa, for the chance to share your wonderful book with our readers! Thank you everyone for your entries! We had eleven suggestions for Halloween patterns, I plugged the numbers into the random number generator and we have a winner! Which is Lisa Black! Congratulations Lisa! 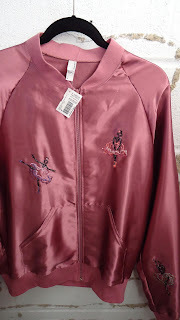 If you could pass your details onto me (Jo) or Flor, Feeling Stitchy's editor, (you'll find our emails on Feeling Stitchy's Email Us page) and we'll get in touch with Maureen from Sew Lovely, who will arrange to get the jacket to you! Thank you again Maureen for such a lovely prize! Patterns: Halloween round up and a Sew Lovely GIVEAWAY!!!! 2) Hallowe'en Trio, an oldy but a goody from a Feeling Stitchy stitch along pattern designed by Cathy Gaubert back in 2011, Jana D recently added a crochet border to her piece and I think it looks great! 3) Dracula by Little Dorrit and Co. (one of the best books of all time in my opinion, the other being of course Frankenstein). Check out the Little Dorrit blog for a free tutorial on how to make their pattern into a tote bag. 6) The Halloween Spooky Sampler from The Frosted Pumpkin Stitchery. 7) Not one but two new Halloween patterns from Badbird (a cartoon style witch and a cutie pie witch). 8) Kitsch Witch, Feeling Stitchy's Halloween stitch along pattern from last year, designed by Cherry and Cinnamon. 9) Cate Anevski's Bride of Frankenstein, which has been on my to-stitch list like forever! 10) Polka and Bloom's skull patterns. 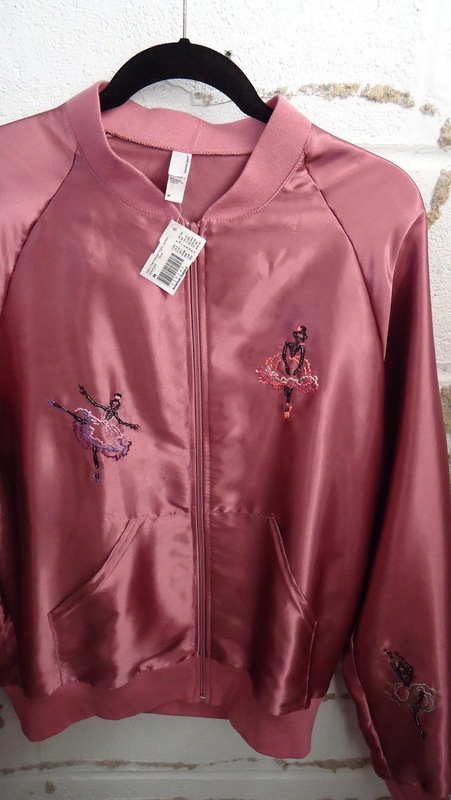 Hand embroidered front and back with dancing skeletons by Maureen from Sew Lovely, the jacket is an American Apparel size medium and to be in with a chance to win it, comment below with the name of your favourite Halloween design, it can be a design already on the list or a new one! The giveaway runs till Wednesday midnight UK time (9th October 2013) and a comment will be picked randomly the next day, don't forget to keep an eye on Feeling Stitchy to see if you've won! (Giveaway is open internationally, thank you Maureen). And on one final note, as we're talking about giveaways, we've yet to hear from the winners of the Alison Glass and Stitched Blooms giveaways, so Margaret Schindler (Alison Glass giveaway) and MelodyJ (Stitched Blooms giveaway), if you could get in touch with Feeling Stitchy's editor Floresita at unafloresita(at)gmail.com, we can pass your details on so that you can receive your prizes!